First of all we are starting a veg garden. This has come from years of watching "The Good Life", we also think it is the right thing to do. Years ago my dad used to grow veg here and he was very successful, now I'm giving it a go! We have fenced off a large area of garden and dug it over - even built a chicken pen with 4 chucks. We now have to put some fertiliser into the ground then plan where and when to plant etc. Thing is I'm a bit green on this so any advice would be great. I expect there are very many folk who will admit to being influenced by Tom and Barbara, don't you Pete? I know I was and that was when "The Good Life" first hit our TV screens in the mid 1970's. If your just begining, try a raised bed or two. 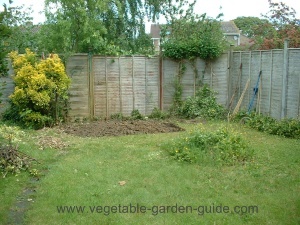 They make vegetable growing more managable - you won't need to dig them every year for a start. Incorporate as much composted vegetable matter or manure as you can find. If your garden is freshly dug or is about to be then you might want to try growing potatoes as a first crop. These will help clear your ground by suppressing fresh weed growth. Have fun and be persistant - experience can only grow with time... just like your veg. Comments for Growing Vegetables - Doing The Good Life! It's funny, I'm from Canada and I grew up watching The Good Life with my mother and loved it. I just rented the series yesterday and got my wife to watch, she thinks there the cutest couple. Just reading this after writing a blog for myself entitled (Good Life) only to discover I havn't got a picture of the garden done yet (lol). I too was influenced by The Good Life - loved it, and I remember when everyone grew veg in their gardens, my father included. Summer days, when everyone was out in their gardens swopping cabbages for tomatoes and this for that etc. We even used to swap trout at the butchers for meat then, how times have changed. Where have those days gone they were definitely better times. I am currently watching the series for the first time and am really enjoying it!